When asked to name a German food, schnitzel is the first thing to pop into the minds of many people. Schnitzel is simply a boneless cut of meat which has been pounded thin with a meat mallet for tenderizing, breaded, and fried. 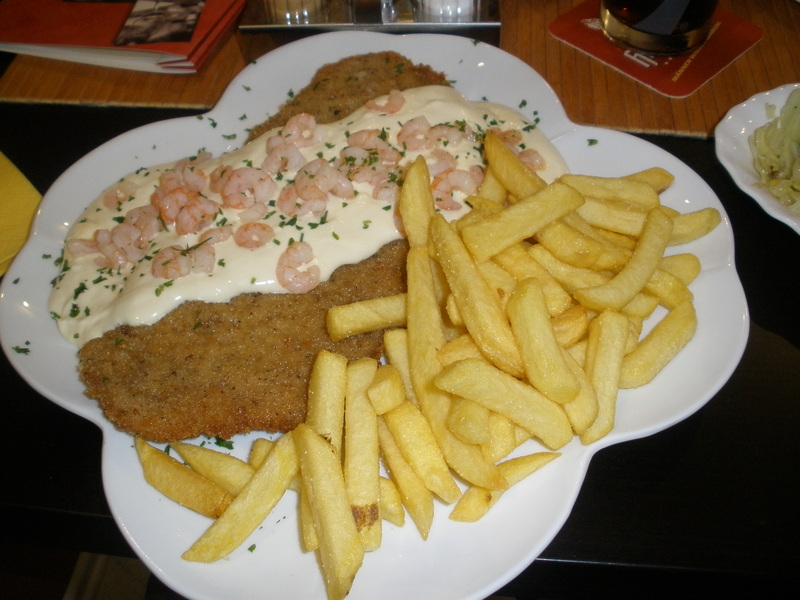 Pork schnitzel is quite common throughout Germany, although any meat may be used (I enjoy the less common chicken schnitzel, myself). In German restaurants, it is sometimes possible to hear a faint “thump, thump” from the kitchen, which is schnitzel being prepared for the next round of diners! Landkirchen is a small town in Fehmarn, Germany and is popular with tourists. Most of the tourists themselves are from other parts of Germany, which bodes well for food offerings. Schnitzel abounds – plain schnitzel and schnitzel with toppings, schnitzel with potato salad and schnitzel with pommes, schnitzel on paper plates and schnitzel all fancied up. Crowded Earth Kitchen sampled the schnitzels throughout Landkirchen by dining where the tables were most full, and where diners were visiting with staff (a hopeful sign that the diners were either locals or returning guests). We were not disappointed. Here are a few photos for you – pick your favorite in the poll below, and Crowded Earth Kitchen will work to recreate the recipe for you! Which recipe would you like to see Crowded Earth Kitchen recreate? This entry was posted in Food, Main Dishes, Travel and tagged Food, Germany, Travel. Bookmark the permalink. The photos are incredible! But just as a small reminder, although it is available in hundreds of cultures, Schnitzel is originally an Austrian dish not German. You raise an excellent point! 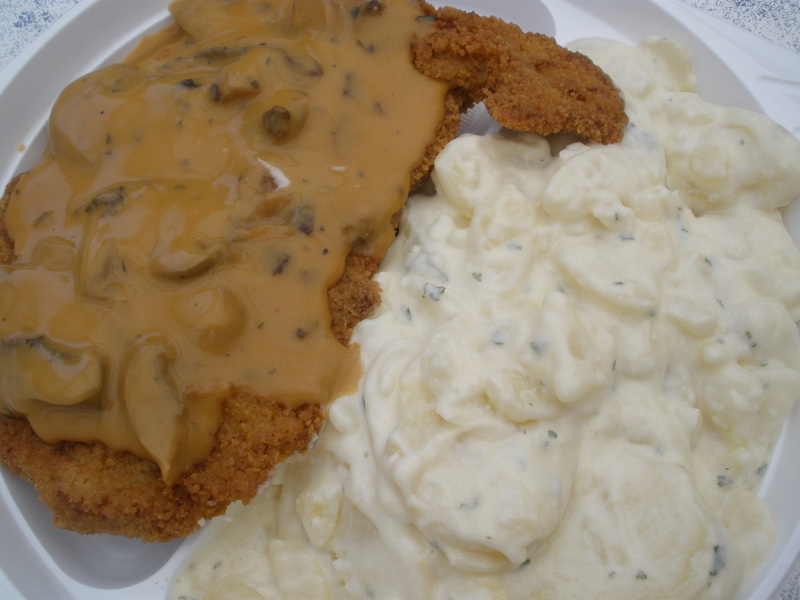 To many Americans, schnitzel is associated with Germany. Perhaps that is simply because there are so many Americans of German descent who have recipes for schnitzel among their family favorites. 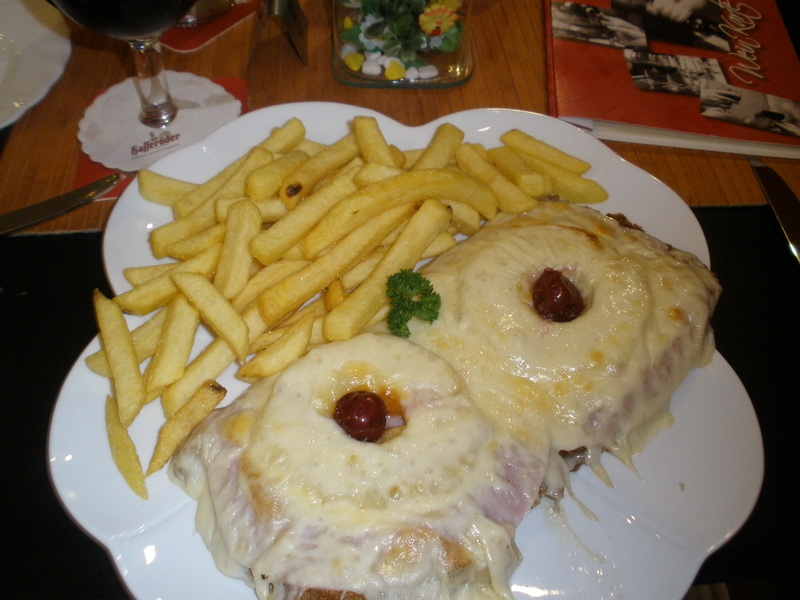 It seems to be a crossover dish which has spread far and wide from it’s Austrian roots. Thanks a lot for your explanatory reply. You’re perfectly right about the American conception of Schnitzel. Now it is a part of almost all of the world cuisines. But I think there is another misconception here that we should discuss. As far as I know, Goulash is originally Hungarian not Austrian, isn’t it?